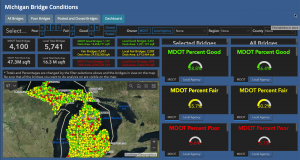 The Bureau of Bridges and Structures has released an interactive map showing Michigan bridge conditions. Only 26.4% of Michigan’s nearly 10,000 bridges are considered in “good” condition. Federal law, outlined in the National Bridge Inspection Standards (NBIS), defines a bridge as a structure carrying traffic with a span greater than 20 feet and requires that all bridges be inspected every two years to monitor and report condition ratings. Condition ratings are based on a 0-9 scale and assigned for each culvert, or the deck, superstructure and substructure of each bridge. These ratings are recorded in the National Bridge Inventory (NBI) database. Condition ratings are an important tool for transportation asset management, as they are used to identify preventative maintenance needs, and to determine rehabilitation and replacement projects that require funding. While the Federal requirements require two categories for reporting purposes (good and poor), the poor category is often further divided to identify varying levels of condition. These condition levels can help prioritize action required. As a bridge ages and deteriorates, its condition rating lowers. A bridge in Poor condition is a candidate for major rehabilitation or replacement and the owner should identify a source for the funding required to accomplish the work. During this process, the bridge continues to deteriorate. When the bridge no longer has the strength to bear the loads for which it was designed, the bridge must be Posted for lower loads to maintain safety. When this process is sufficiently delayed, the condition may deteriorate to the point that the bridge is rated as Serious or Critical. A bridge in Serious or Critical condition often needs expensive emergency repairs, temporary supports, or false decking installed to prevent falling concrete from striking vehicles. Ultimately, the inability to obtain funding for preventative maintenance, rehabilitation or replacement could result in a safety risk to the public and the bridge must be Closed. When funding is not available for the projects necessary to correct Poor, Serious or Critical bridges, a bridge owner must take measures to ensure the safety of the motoring public. However, these measures can have negative impacts to traffic. Common emergency safety measures include the installation of temporary supports to maintain traffic, which can negatively affect mobility on the route below the structure. Deteriorating conditions generally lead to increased inspection frequencies, which in turn will increase engineering costs. Posting a structure for reduced loads may allow a bridge to remain open, but will inhibit the movement of freight and agricultural goods. Finally, closing a bridge will maintain safety but entails loss of productivity and increased costs for industry and the public.